We might blame genetics or age for our joint pain, but often it's caused by those excess pounds we carry around. Doctors say that's especially the case with osteoarthritis -- chronic degeneration of cartilage -- in weight-bearing joints such as hips and knees. "The relationship between obesity, diabetes, metabolic syndrome and the development of arthritis has been very well-defined," said Dr. Richard Iorio, an orthopedic surgeon and a spokesman for the American Academy of Orthopaedic Surgeons. The prevalence of arthritis in the obese population -- nearly 32 percent -- is double the rate found in the general population, he said. As waistlines have ballooned, so have the number of total hip and knee replacements. The number of total knee replacements more than doubled in the decade between 2000 and 2010, from 282,350 to 658,340. During that same period, total hip replacements soared by 83 percent. A growing and aging population explains part of the increase, as does a greater willingness among doctors to operate on younger patients now that joint replacements last longer. But research published last year suggests that the obesity epidemic accounts for about 20 percent of the increase in total knee replacements. "We were surprised that it was that low," said Elena Losina, co-director for the Orthopedics and Arthritis Center for Outcomes Research at Brigham and Women's Hospital in Boston. 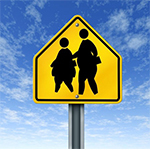 "We do know that obesity is a great contributor to the development of osteoarthritis." Her research found that the increase in total knee replacements might also reflect a growing number of knee injuries and expanding indications for the procedure. "Obesity is definitely a major factor," said Dr. Bryan Chambers, an orthopedic surgeon with Cardinal Orthopaedic Institute in the Columbus area. "It is the leading factor that we have some sort of control over." But once the damage is done, it's irreversible, Iorio said. "We cannot fix the cartilage and stop the arthritic process." Excess weight places a disproportionate amount of stress on the surface areas of the bones, potentially wearing away the cartilage in the joint. During certain activities, such as stair-climbing, that extra weight placed on the joints is multiplied many times over. Studies also have found that obese patients are at a higher risk of developing complications after total joint replacement. The best suggestion for those hoping to head off the need for that surgery is a familiar one that's not always easy to follow: diet and exercise. But not just any exercise. High-impact exercises such as running in many cases can cause injury or aggravate dormant arthritis. "Lots and lots of people, in their attempt to get the weight off, they start exercising," said Dr. Raymond Tesner, a local orthopedic surgeon and member of the OhioHealth Sports Medicine Institute. "If you're not careful, that's a very good way to aggravate that arthritis in the knee that's been dormant." He recommends lower-impact exercises such as swimming and biking, but puts a premium on proper diet. Exercise has its benefits, Chambers said. For example, it can help strengthen one's legs, ultimately providing more support for arthritic joints. Resigning oneself to a joint replacement can be risky, Iorio said. "We have to be careful because these operations have finite life expectancies."